Mike Pinder of the Moody Blues once wrote, "Thinking is the best way to travel." 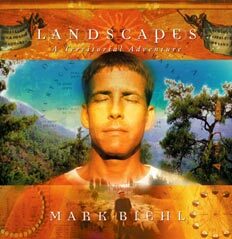 On his debut CD, LANDSCAPES, Mark Biehl takes that sentiment to heart as he guides you in an exciting journey to distant lands and exotic places. "Ever since I was young, I've had a clear sense of the power of the imagination," says Biehl, who composed and performed the entire project himself using a tasteful blend of interwoven sampled and synthesized sources. "Most children have the ability to create wondrous journeys with their minds. As we grow older, it becomes more and more difficult to retain those innocent beliefs. I consider this new CD to be an invitation to return to a place where the imagination is allowed to run free." on a spiritual sojourn with Nepalese salt traders across the treacherous Himalayan mountains to the high plateau of Tibet. High-speed enjoyment follows next in Chamonix-Mont-Blanc, as you experience an invigorating downhill snow skiing run from the highest peak in the French Alps. the winding path of Euphrates, the timeless waterway of the Middle East that has sustained mankind from the earliest days of civilization. a wild and rugged African land of vast desert sands inhabited by a people whose hunter-gatherer way of life still exists today. Next, take a propelling launch into space as you escape Earth's orbit on a mission to explore our planetary neighbor, Mars, and witness firsthand the controversial face of Cydonia, a little known region that may hold evidence of an ancient extraterrestrial civilization. a 19th century sailing ship in The Treasure of Lima, and ponder the secret to its cargo of precious jewels and priceless relics. Guided by the trade winds, a blissful voyage to the uncharted waters of the South Pacific ensues, providing an introduction to the planned follow-up in the LANDSCAPES series: ISLANDS. LANDSCAPES was mastered by renowned engineer Bob Katz, who won a Grammy® Award in 1997 in the Best Latin Jazz Recording category. Katz is also an engineer of choice for the Chesky Records audiophile label. Combined with Biehl's artful use of sampling and sequencing, this debut CD sparkles with clarity and inspiration. "Imagination is the basis for all creation, and creativity itself is the essential spark of life which gives all of us a grounded sense of purpose, or reason for living," Biehl adds. "By inviting listeners to become travelers to faraway lands, I hope to give them a sense of creative freedom by encouraging their use of the imagination." Click here to listen to a MP3 of the track and read the song narrative.